While the rest of us are still struggling to get ahead? The first of its kind to appear in America in nearly 50 years. Shares you can buy TODAY for as little as $0.01. 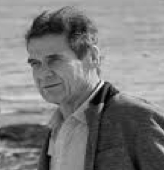 Billionaire investor Tim Draper – known as the “Nostradamus of the markets” – recently invested $150 million. And Marc Andreessen, co-founder of Netscape and board member of Facebook and eBay, already invested $50 million into this new market. To be clear: This exchange is 100% outside Wall Street. Yet it already holds more than $100 billion in value. And activity is picking up. As thousands of people around the globe have begun clamoring to get in. That’s why, a few months ago, Congress passed a bill that will, among other things, “prioritize accelerating the development” of this new market. In as little as 1 year from now, when this legislation will likely take full effect. Meaning that by 2022, this new market will be the 4th largest exchange in the world, at a mind-bending $5 trillion. Bigger than Japan’s Tokyo Stock Exchange, the Shanghai and Hong Kong stock exchanges. Even larger than Canada’s Toronto Stock Exchange! Consider that in the last five years, the Nasdaq grew 222%. Enough to turn every $1,000 investment into $2,170. In the past 24 months alone, it’s surged 3,465%. Enough to turn every $1,000 into over $35,000. And every $5,000 into more than $178,000. 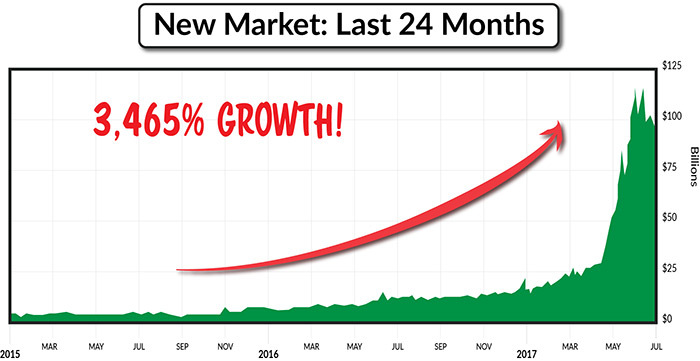 Never has a market shown such explosive growth. Especially one so little known. This new market is growing so quickly, the mainstream media are slow to realize what’s really happening. As a result, YOU may be missing out what could be the greatest opportunity in your lifetime to build life-changing wealth. Which is why I’ve rushed to put out this urgent announcement. The first of its kind to appear in America in nearly 50 years, since the Nasdaq opened in 1971. You’ll learn how they’re turning small “pocket change” investments into $32,000, $135,000, and even $1.3 million. And you’ll learn how you can personally participate in the coming 4,900% growth. I’m a former hedge fund manager and past Vice President at one of Wall Street’s most prestigious firms. Since moving my family to the Pennsylvania countryside in 2001, I now spend my time investigating opportunities that mainstream media sources either ignore or don’t understand. Like the new “stock market” I’m revealing today. These are just everyday folks – often first-time investors - who learned about this new market and are now making life-changing gains. “This has felt like a chance to recover the opportunities I saw and missed in the ’80s and ’90s with Apple, Microsoft, and AOL,” he said. Michael G. started investing in the new market only three months ago. 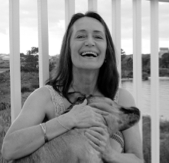 Michielle O. was a self-proclaimed “first time investor” when she signed up. “I’ve grown my savings from $20,000 to $135,000 in less than three months,” she said. Take a look at this chart. It appeared in Forbes just weeks ago. And thousands of others who are making an absolute killing in this new market. 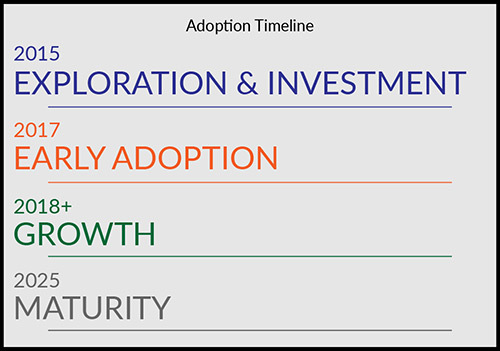 I want you to be fully prepared to take advantage of the coming 4,900% growth. And for the record, you don’t have to be wealthy to get involved. If you’re like hundreds of people I’ve heard from, you’ll find it’s easier than opening a bank account… or buying stocks through a brokerage or your 401(k). But you’ll need to move quickly. Already, some of Wall Street's savviest players are starting to pile in. And as you’ll learn, thousands of regular Mom and Pop investors will soon join them, driving up prices further. By the time that happens, the biggest gains will be gone. And it’s the last chance Middle Class America may have get back on track after 2008. Even a simple savings account to hold cash… please pay close attention. This could be the most important demonstration you’ll ever see. I’ve never seen any trend with this much profit potential. 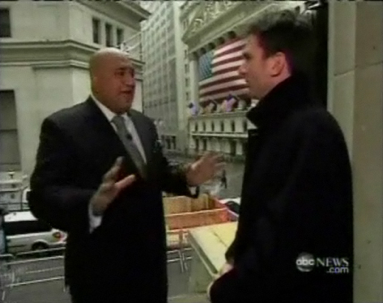 You see, in the aftermath of 2008, I caught wind of an obscure market developing… completely off the Wall Street grid. But again, you don’t need millions to get started. In a moment, I’ll introduce you to dozens of ordinary investors who have turned a few hundred dollars into five- and six-figure nest eggs. Let’s rewind the clock a moment, to nearly 50 years ago today. This isn’t the first time a brand-new market has threatened to upend Wall Street – and even the global economy – as we know it. You see, before the Nasdaq opened in 1971, you couldn’t easily buy many of America’s best companies. Disney, Wal-Mart, Intel, McDonald’s and hundreds of America’s best up-and-comers didn’t trade on the big markets. They simply didn’t meet the strict criteria to trade on the New York Stock Exchange or the American Stock Exchange. And despite their incredible potential, these future-greats were mostly ignored. Until 1971… when the Nasdaq hit the scene and blew the whole game wide open. For the first time ever, you could see real-time quotes of tens of thousands of “unlisted” companies… in an instant. As a result, the Nasdaq became the main arena to launch many of today’s trophy assets, including Microsoft, Cisco, Oracle, and Apple. And millions of dollars poured into them. 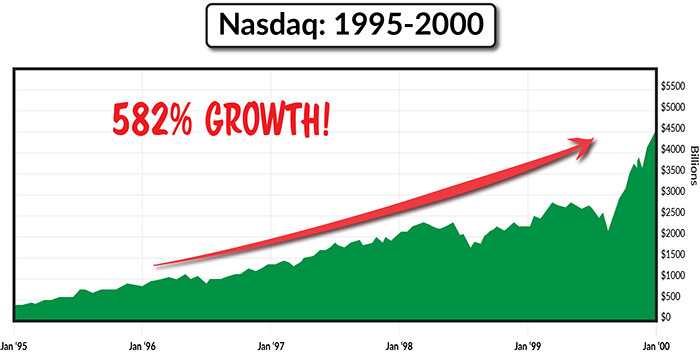 From 1995-2000, the Nasdaq grew a staggering 582%. As impressive as that is, it’s nothing compared to what’s happening today. In the past 24 months alone, America’s newest market – which some are calling the “New Nasdaq” – has grown a mind-boggling 3,465%. Sending prices 4,900% higher or more, starting as early as 2017. After all, if this was truly a new stock market, wouldn’t everyone be talking about it? 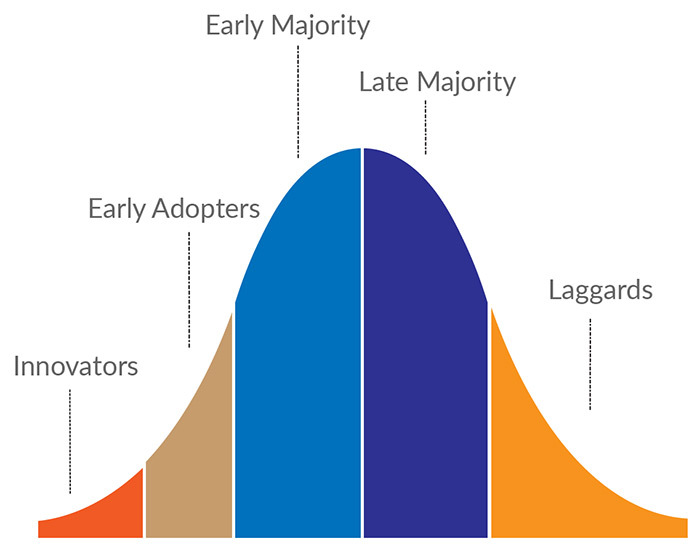 Every innovation goes through a predictable pattern on its way to mass adoption. It’s a common pattern first observed in 1962 by famed American theorist Everett Rogers. The folks who made personal fortunes off these companies weren’t smarter than everyone else. They simply got in before everyone else – when these companies were selling for just a few dollars a share. 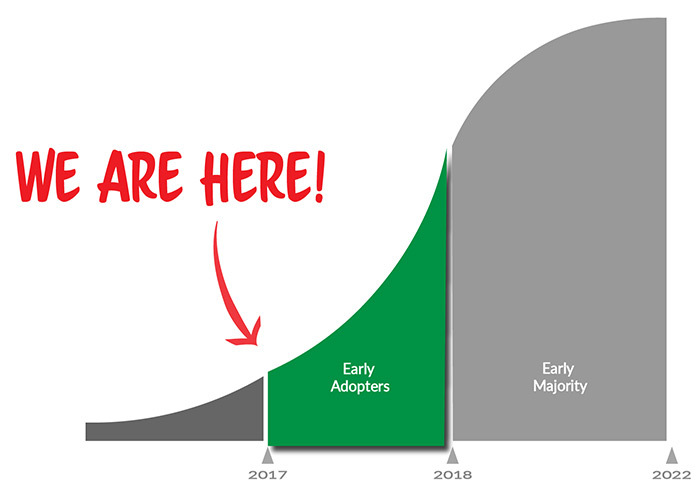 2017 marks the year the “New Nasdaq” moved into the Early Adopter phase. Sending prices soaring 4,900% or more. And even the World Economic Forum agrees. 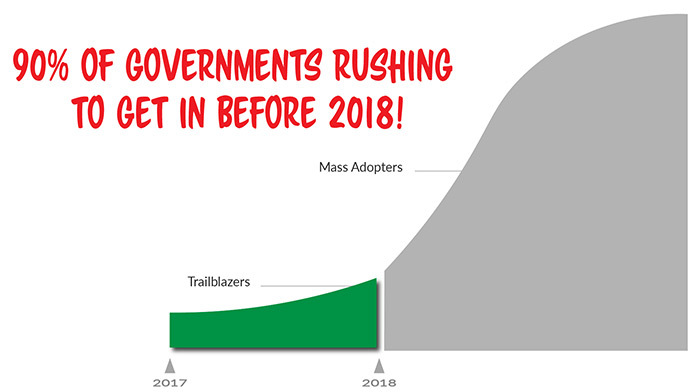 According to their recent study, the “New Nasdaq’s” tipping point will hit sometime within the next 5 years. 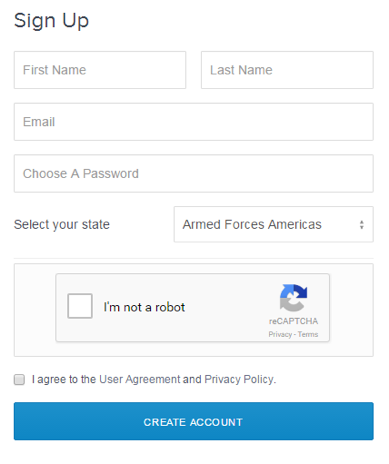 For starters, it’s completely free to set up an account. Consider that most mutual funds today require between $500 and $3,000 just to get started! And some of the most successful funds require a minimum investment of tens of thousands – even millions – of dollars. Often, you must have a net worth of at least $1 million just to get in the door. But the “New Nasdaq” requires zero startup fees. Heck, even if you have a few dollars to your name, you can start with as little as $10. And you can begin immediately by investing in the world’s next Amazon, Google, Apple, and more! And because the “New Nasdaq” is truly “the World’s First International Exchange”… you can access it from anywhere, any time. And you don’t have to pay a cent to your broker or banker. You invest directly with the companies themselves. That means for every trade you make, more money stays in your pocket and out of the pocket of bankers, brokers, and other Wall Street operatives. To be clear: Even though the investment opportunities are public, you can’t buy them anywhere else. The “New Nasdaq” is an opportunity to do something different. You can’t buy these 900+ names on any other exchange you might be familiar with. And it’s different from buying stocks in a company like you do on the Nasdaq or NYSE. You’ll get Ethan Allen Industries, the American furniture chain. Ethan Allen generated 12% annual returns the last five years. That’s enough to turn every $1,000 into over $1,700. Not bad… but you aren’t going to get rich that way. 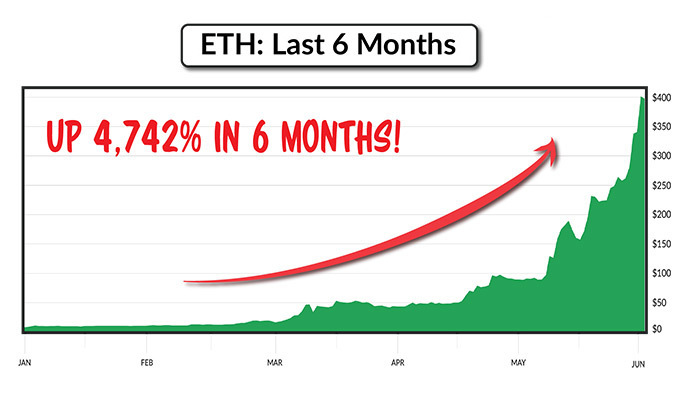 But type in “ETH” into the “New Nasdaq” website, and you’ll find a company that rose 4,734% in the last 6 months. If you invested $1,000 in ETH on January 1, 2017, you’d be sitting on more than $48,000 only 6 months later. What caused the huge price surge? The company created a brand-new tech platform that’s nothing short of revolutionary. The platform makes it easier for banks to transfer funds to other banks, cutting down on time and cost. Accenture, the global management consulting firm, estimates this company’s technology could save banks $8-12 billion a year in infrastructure costs. Along with Wells Fargo, Barclays, HSBC, TD Bank, Bank of America, Citi Bank… and dozens of others who have all put hard cash behind this company. You see, they all know our current banking infrastructure is failing. It’s essentially using “old plumbing” that’s been around since the 1700s. Case in point: It still takes 3-5 days to clear a simple check in your bank account. It takes less than 3-5 days to ship a package from Amazon to your doorstep! ETH solves the bank’s problem in seconds, along with thousands of others both inside and outside the banking industry. Which is why it will be one of the most recognized companies in the world in the next few years. As recognizable as Apple or Microsoft. And yet, ETH doesn’t even exist on the U.S. stock market. But it’s already making some “in the know” investors very, very rich. Like 40-year-old physician Allen D.
Dr. Allen turned a $2,520 stake in ETH into $120,000 in the first half of 2017! Type in STEEM over at Yahoo! Finance, and you’ll draw a blank. 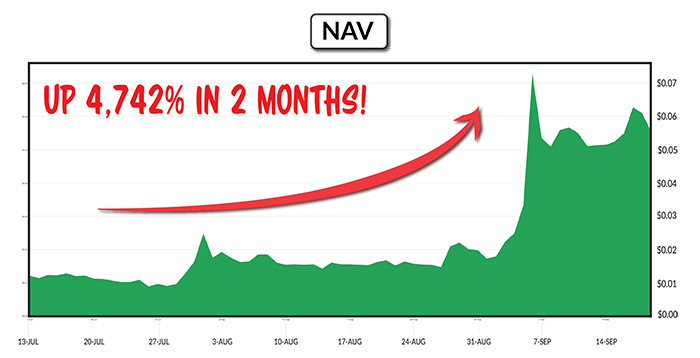 But over here on the “New Nasdaq”… you’ll find a company that shot up 1,045% in 6 weeks! 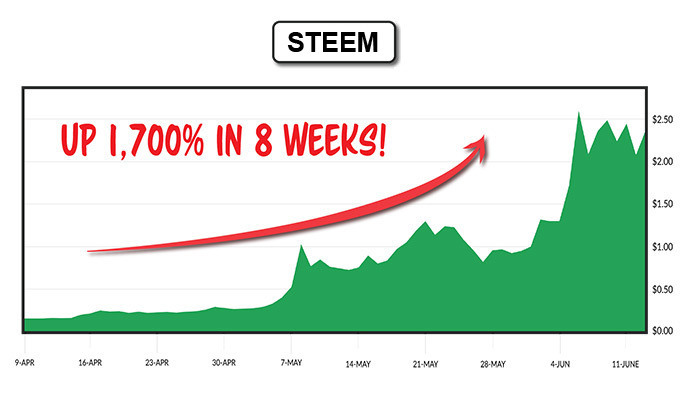 If you invested just $500 in STEEM in March 2017… you’d be sitting on over $5,700 six weeks later. If you invested $5,000, you’d have $16,500 in just six weeks! What’s so special about STEEM? This company has created a new social network to rival Facebook, Instagram, Twitter, and other top social networking sites today. Already, it has more than 100,000 users… which it gained in under five months. Twitter, the fourth most popular social media app in the world, took 9 months to reach its first 100,000 users. And it wasn’t even a year old yet! And according to Alexa, Amazon’s analytics division, this company has more page views per user than Facebook, Twitter and LinkedIn, three of the world’s most popular social media sites. And it’s been turning incredible profits for everyday investors. Yet they gained 2,700% from this company. But I think the best gains are still ahead. In fact, you can still buy in for as little as $1.25! Over at Yahoo! 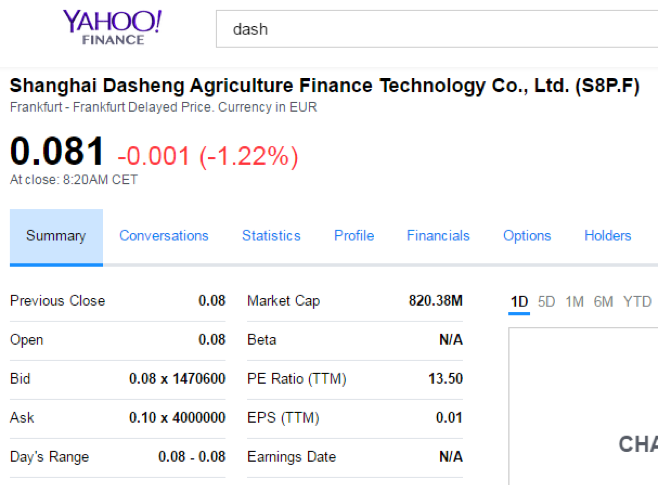 Finance, the closest you’ll get is the Shanghai Dasheng Agriculture Finance Technology Fund. Not what we’re looking for. 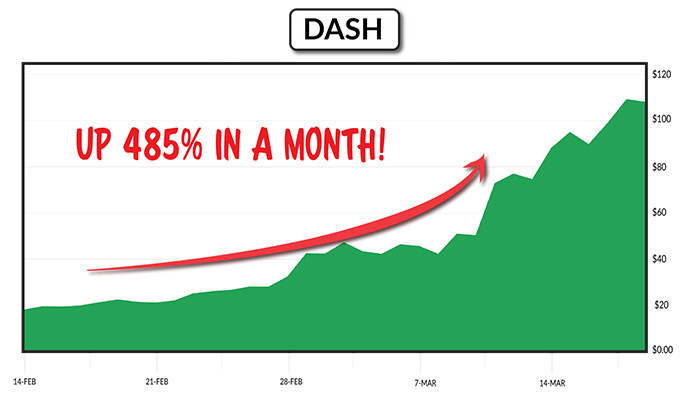 But enter “DASH” in the “New Nasdaq”, and you’ll find a company that shot up 485% in 30 days! Enough to turn every $500 into $2,925… all in a month’s time. DASH lets you make instant, private payments online (or even in-store) that are completely anonymous. But there’s no way to track a purchase using DASH. It’s impossible. Not even the U.S. government, the NSA, or Russian spies can link you to a purchase you’ve made. DASH makes your purchase chain 100% untraceable, now and forever. Except unlike cash, it’s much harder to misplace or have stolen. Why would the U.S. government allow this to exist? You might be surprised to know that yes, it’s 100% legit. And in coming months, the U.S. is expected to follow suit, thanks to such efforts as bill HR 835. 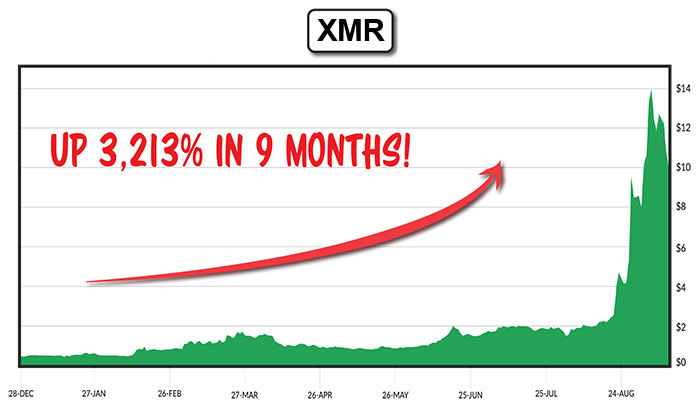 Millions of dollars will flow toward companies like “XMR”… which jumped 3,213% in 9 months! A $500 stake in XMR would have ballooned into $16,565 just 9 months later. Every $1,000 would have turned into over $33,3000. 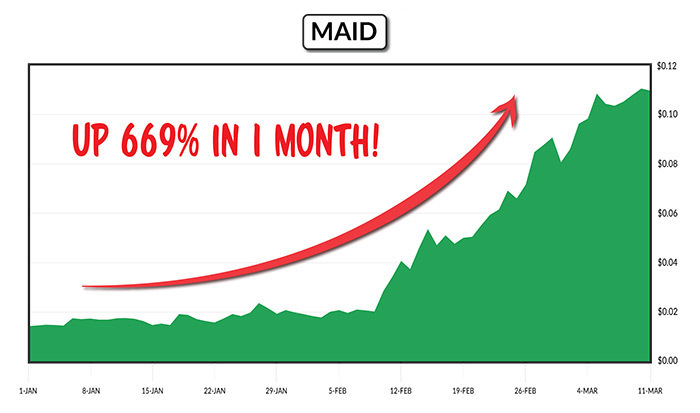 MAID… 669% in a month! 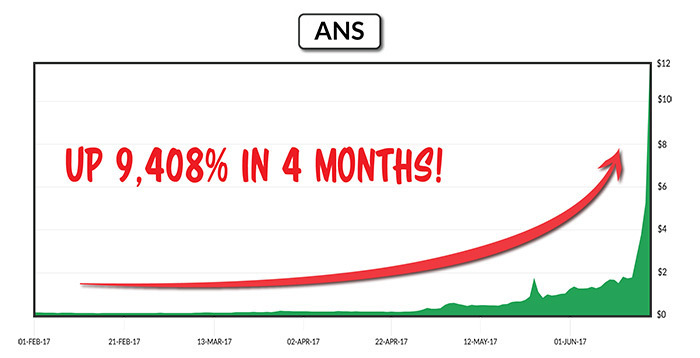 And NEOS… up a mind-numbing 27,960% in a single year! 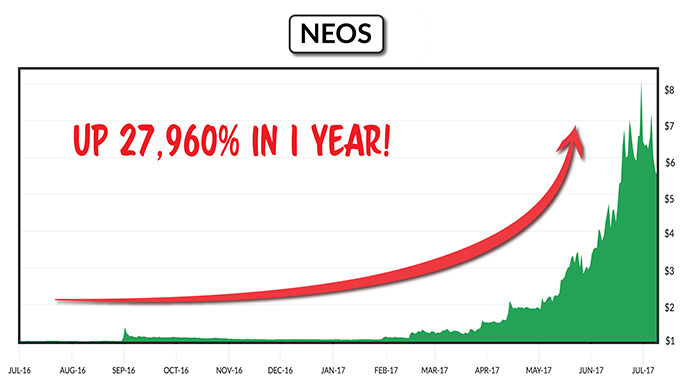 $500 invested in NEOS turned into over $140,000 one year later. A $1,000 investment ballooned into life-changing $280,000. And soon, it could be one of the largest insurance companies in the world. Yet you’ll never find it on the regular stock market. But you’ll be surprised to find that most sell for pennies on the dollar. As I said, we’re still in the early stage. For example, in February 2017, I told my readers to take a stake in a small “New Nasdaq” firm founded in 2015. At the time, it sold for $0.12 a share. Anyone who took my advice turned every $500 into over $47,000. All from a $500 stake in a tiny 12-cent company! Based on what I’m seeing coming, this company could hit $600 a share in the coming months. Every $500 investment TODAY will be worth over $26,000. There are hundreds of plays like this. And you can buy 99% of companies listed on the “New Nasdaq” for $20 a share or less. And with a few simple maneuvers from your cellphone, cash out immediately. Or go buy yourself that boat you always wanted. Because hundreds of new opportunities are launching every month. And they’re kicking out gains unlike anything I’ve ever seen in my 25+ years in Wall Street. Of course, just like any investment, nothing is guaranteed. There is risk involved with the “New Nasdaq.” As with any new exchange, there can be volatility so you shouldn’t bet the farm here. But really… you don’t need to. You can put just a little bit of money into this idea to really move the needle. So how do you decide which ones to buy? Well, the truth is – not all of these companies will survive. That’s just how it goes with new technology and innovation. I believe they have the best potential to generate huge returns starting in 2017 and beyond. I’d like to send you a FREE copy, as thanks for taking the time to read this letter today. This report includes the names and ticker symbols of FOUR game-changing companies. As you know, Amazon makes it easy for people to conduct business across state and national borders. But already in 2017, Company #1 does it better. Last year, Amazon averaged $372 million in business daily. And it’s projected to do 3 times the business of Amazon by the end of 2017. Turning every $500 into $110,500. Company #2 has the technology that could “rewire” the very Internet itself. Most people don’t realize it, but the internet today is ruled by a handful of “Big Data” companies like Google, Amazon, and Facebook. These “all-knowing” companies track your every move, and often sell your data to advertisers for a profit. Company #2 promises to put an end to that… by adding privacy back into the internet. And if you invest in these FOUR companies today, you’ll produce gains unlike anything you’ve ever seen in stock market history. But I cannot stress enough: There is no time to waste. Already, activity is picking up. And by the end of the year, the fastest gains could well be gone. Again, you’ll receive the names of these FOUR companies in my special briefing, The Most Explosive New Nasdaq Plays of 2017. But first, I promised to show you how easy it is to buy these companies on the “New Nasdaq” – and hundreds just like them. Here is an actual screenshot from a “New Nasdaq” account. 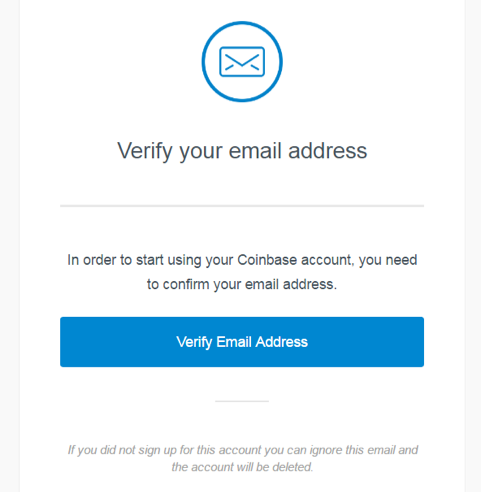 And within minutes, you’ll automatically get an email verifying your account is open. 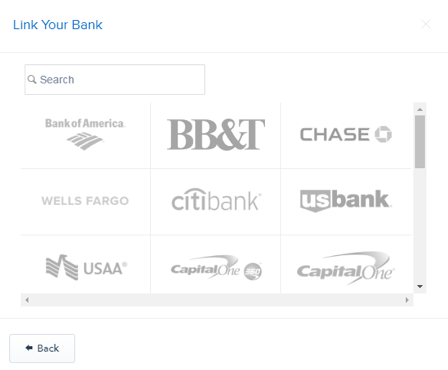 Your “New Nasdaq” account can be linked to just about any bank. You just click on your bank. Then decide how much to transfer. That’s it! You’re ready to buy your first share. No paperwork, no questionnaires, no trip to the bank. Remember that Microsoft, Google, and some of the world’s savviest investors have already moved millions to accounts just like this. Hundreds of banks have already laid the groundwork for easy buying and selling. 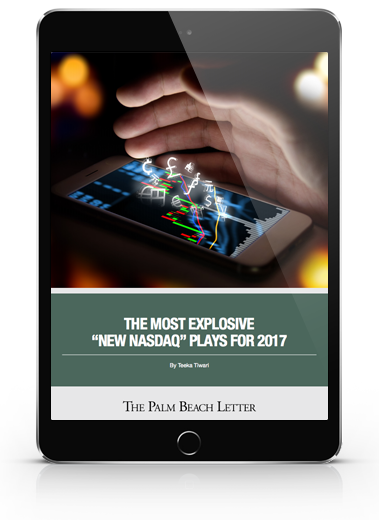 But I will tell you everything you need to know – for free – in The Most Explosive New Nasdaq Plays of 2017. And to help you get off on the best foot possible, I’d also like to send you a complimentary copy of my brand-new “how to” book. It’s titled New World Money… and it’s coming hot off the press as I type this. 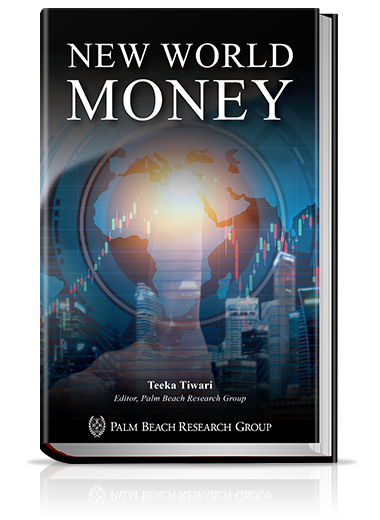 New World Money is the culmination of thousands of miles logged… and tens of thousands of hours of research from a team of nearly two dozen research analysts, investigators, and journalists. In it, I’ll hold you by the hand and explain the entire process in detail. 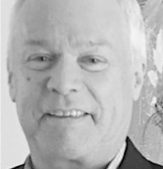 The “Asymmetric Playbook”: How to create life-changing wealth by using this “unfair advantage” like top hedge fund managers like Peter Lynch, Carl Icahn, and George Soros. By the way, I’m not offering it for public sale anywhere. You won’t find it on Amazon, Barnes and Noble, or any public bookseller. Along with a copy of The Most Explosive New Nasdaq Plays of 2017, the report I mentioned earlier. That way, in as little as 10 minutes, you can unlock everything the “New Nasdaq” offers. 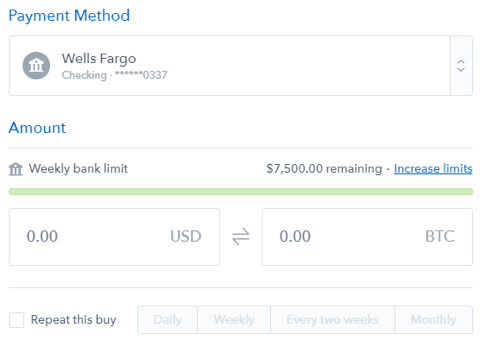 And you can begin making 485%, 669%, 1,045%, 4,734%, and more the second you create an account. As I mentioned, my name is Teeka Tiwari. And I began writing my monthly bulletin, The Palm Beach Letter. To help my readers get a little bit richer every year through smart, conservative investing. As I write, my recommendations show an average gain of 283%. As for the “New Nasdaq” recommendations, we’re up as much as 300%, 672%, 1,881%, 3,174%, and more. Now, the “New Nasdaq” is one of many opportunities I cover in the Palm Beach Letter. Like the government-backed “income certificates” that pay out 16% every year. Income that grows every year, regardless of what’s happening in the stock market. As you can imagine, news of our organization has spread far and wide. To date, over 80,000 people follow our research. And you’ll receive all the latest developments happening both on and off Wall Street. Step-by-step video guides… that’ll walk you through how to open an account, buy your first “share” for as little as $0.01, secure your account, and even take profits. Simply follow along on screen. The New Nasdaq International Buying Guide… a comprehensive manual for accessing the “New Nasdaq” from anywhere in the world, using any currency. 12 full issues of my monthly advisory… sent to your inbox on the first Thursday of the month. Here I explore the latest moneymaking opportunity I’m most excited about. 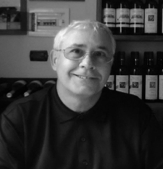 I publish one new recommendation on average every month. For example, in December 2015, I recommended my readers buy a small chip-making company, NVIDIA. It went on to become the top-performing stock of the entire S&P 500 in 2016. Your special member portal… housing all my exclusive research, which you can access 24/7, 365. Breaking news alerts from the field… sent straight to your inbox whenever there’s an urgent opportunity you must act quickly on. The Palm Beach Daily… compiled by dozens of expert analysts and researchers on my team, this quick 3-minute read will bring you up to speed on the most important news you need to know for the day. I suggest you enjoy it with your morning cup of coffee. Along with The Most Explosive New Nasdaq Plays of 2017, which includes the names of FOUR companies I recommend you buy immediately. All in, that’s over $540 in total value. It’s a red-hot bargain at that price. Especially given the opportunities we have at stake. But, today, I don’t want the price to be an obstacle. The truth is: I’m not doing this to get rich. I’ve already made my money, overseeing millions for Wall Street. I’m more excited about teaching folks like you how to reach the level of financial independence you’ve worked so hard to achieve. It’s no secret: The investing landscape isn’t what it used to be. Not to mention: We have an imminent retirement crisis on our hands, as Social Security, Medicare and Medicaid funds are quickly drying up. I have serious concerns about the future of most Americans. That’s why it’s not going to cost you anywhere close to $540 to accept my invitation today. Yet, just like your IRA and 401(k), these accounts let you save and grow your money – tax-free – now and through your golden years. And currently earn 5 times more than your bank savings account and CDs. You’re free to withdraw your money any time – without penalty. And you don’t have to report any of the income to the IRS, so long as you set it up correctly. For one big reason: The U.S. government restricts advertising of these special accounts. For decades, they’ve remained the exclusive tax-haven for the rich – top bankers, Fortune 500 executives, and even U.S. presidents. Along with high-level executives of some of America’s biggest banks – including Wells Fargo, Bank of America, JPMorgan Chase, and Citibank. 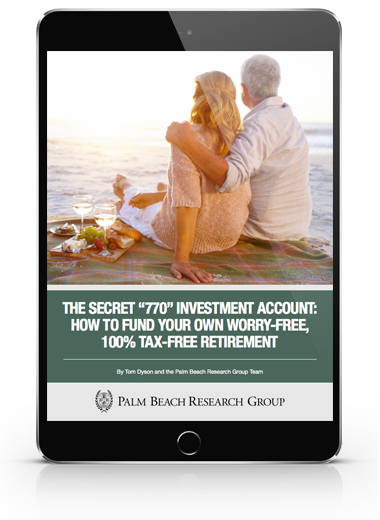 I’ll send you the full briefing – including where to go to open an account – in your free report, How to Fund Your Own Worry-Free, 100% Tax-Free Retirement. It’s worth noting: Since this report is normally reserved for my readers, you won’t find it available for public sale anywhere. But as soon as you take advantage of the no-risk membership today, you’ll have immediate access to everything I’ve mentioned in this letter. The truth is: Middlemen have inserted themselves into all aspects of our lives, not just the markets. And thrive on our digital innocence. Unless you can understand today’s high-tech market place, you may be paying THOUSANDS in senseless costs. That’s why I want to arm you with this timely report. It’ll help you protect yourself from today’s modern-day, digital gangsters. It’s full of HUNDREDS of little-known tricks and shortcuts to save money and improve your lifestyle now and in retirement. All together, these tools could save you an easy $2,500 or more over the next year alone – and then again the following year. That’s almost $5,000 saved, simply by making a few easy tweaks to your routine. Which you’ll receive, along with everything I’ve mentioned in this letter so far. All told, we’re looking at over $674 worth of valuable research. But as I said, by taking advantage of the RISK-FREE offer today, you won’t have to pay anywhere close to that. See my portfolio results with your own eyes. And you’ll receive every cent of your membership fee back. 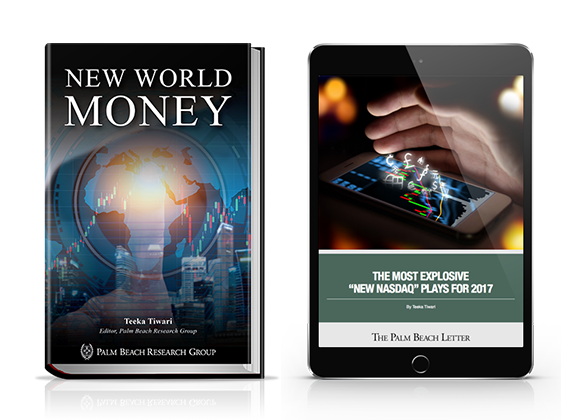 Plus, you can keep everything you’ve received – every special report, including The Most Explosive New Nasdaq Plays of 2017, and my new book, New World Money – on me. So how much will a trial subscription to The Palm Beach Letter cost? I’m offering it for not a penny more than what it costs my team to produce it. I’m talking less than a cup of coffee a week. 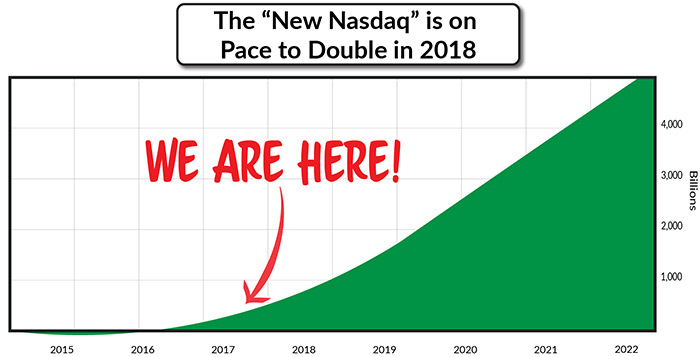 Frankly, if you could only see what’s been happening in the past few months on the New Nasdaq – that alone is worth multiples of what I’m offering today. I sincerely hope you’ll join me in the next 24 hours, by signing up for The Palm Beach Letter today. I’m excited for you to begin participating in what is – hands-down – the greatest moneymaking opportunity of our lifetimes. Because one thing I’ve learned over the years is that markets like this don’t come around often. You have to make hay while the sun is shining. And right now, the sun is blistering. And it’s growing 32 times faster than the “old” Nasdaq. Already, this market is on pace to double in 2018. We are at the doorstep of the world’s next major market boom. Already, over 33,000 people are signing up every day. And at least 108 major companies have begun investing, including Intel, Toyota, Samsung, JPMorgan, Google, and Microsoft. There’s no time to lose. The window of opportunity is quickly closing, and I don’t want you to miss out. If you’re at all dissatisfied, simply get in touch and ask for a full refund. We’ll part as friends, and you can keep all resources I mentioned today – free of charge. I look forward to welcoming you to The Palm Beach Letter, and into a new era of wealth. 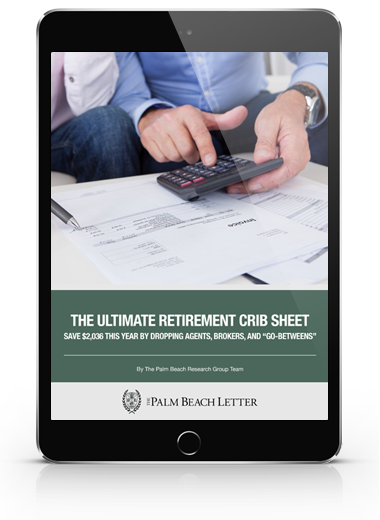 – John and Sandy M.
© 2017 Palm Beach Research Group. All Rights Reserved. Protected by copyright laws of the United States and international treaties. This website may only be used pursuant to the subscription agreement and any reproduction, copying, or redistribution (electronic or otherwise, including on the world wide web), in whole or in part, is strictly prohibited without the express written permission of Palm Beach Research Group, 55 NE 5th Avenue Suite 100, Delray Beach, FL 33483.